The Viking Difference: The Thinking Person’s Cruise. SERENE SCANDINAVIAN SPACES. We have fine-tuned the art of exploring the world in comfort. Our ships have been thoughtfully engineered by nautical architects to bring the outside in with large, expansive windows. Graceful staterooms and suites are designed for ultimate comfort and serenity, and light-filled public spaces inspire and refresh you throughout your journey. We’ve designed our ships down to the most minute detail—from the light and airy Atrium to the relaxing Viking Lounge. MORE STATEROOM VARIETY THAN OTHER SHIPS. Your private sanctuary on the river. Viking’s innovative thinking and patented design provides you with more choices and a more enriching overall experience than other ships. Each of our spacious staterooms offers deluxe comfort during your river cruise. Whichever stateroom you choose, your hotel-style bed topped with European linens and duvets provides the perfect place to turn in after a full day of exploring Europe’s great towns and cities. And you’ll feel pampered by bathrooms equipped with heated floors and premium Freyja™ bath products. GENUINE & THOUGHTFUL SERVICE. At Viking, our Swiss-trained, friendly and knowledgeable staff are all devoted to making your onboard stay the most memorable possible. Our ships are small and intimate, and every member of our staff—from stateroom stewards to our Guest Services team—is dedicated to personally hosting you. We are quite confident we will exceed your expectations that we have guaranteed our award-winning service—the only cruise line to do so. Viking offers the lowest prices, however, it is the least inclusive when it comes to beverages and added value so keep that in mind when you look at just the cost of the initial cruise fare. If you want an excellent Viking experience, try their new ocean liners. They have been voted best cruise line for 2016. 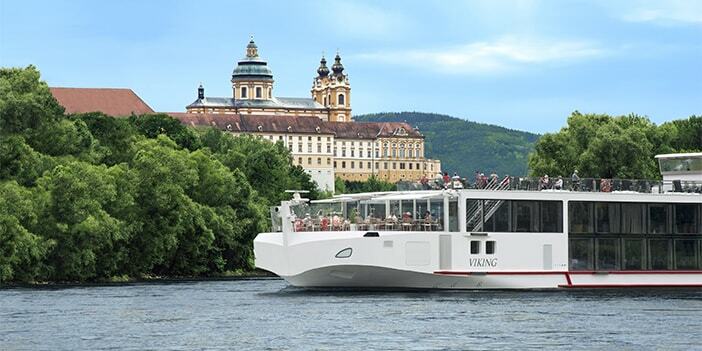 As far as river cruise lines go, there are other cruise lines that you may want to consider for your bucket list trip (AMA and Avalon if you don't want to break the bank). "I haven't been everywhere, but it's on my list.."
Copyright 2018 Extra Mile Travel. All rights reserved.